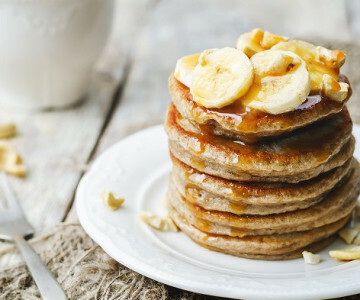 Whether it’s for Pancake Day, a delicious dessert or as a weekend breakfast treat – these banana pancakes won’t disappoint! Follow this step by step guide to creating perfectly fluffy pancakes, with a fruity topping. 1) Whisk the eggs in a bowl until blended. Peel and puree one of your bananas and add it to the egg mix. Cut the remaining bananas into thin slices and set aside. 2) Now add the milk and honey to the banana/egg mix. 3) Sift in the flour and baking powder. Gently fold through to create a batter consistency. 4) Heat a large frying pan and add a little oil or butter. Add a ladle of the batter mix to the pan then add 3-4 banana slices to the uncooked side of each pancake. 5) Once you can see bubbles forming toward the centre of each pancake and it starts to set on the bottom, flip it over and cook it until it’s golden on the banana side. 6) Keep the cooked pancakes in a warm oven while you finish the batch. Serve with butter, honey and extra slices of banana on top.